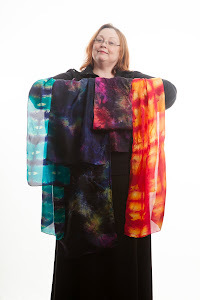 janet procure ... silk and mixed media artist: New residency - at home! After reading a lot of art bloggers talking about how hard it is to stay focussed on their art - especially as Spring approaches - my friend and fellow artist Pat Moore and I decided on a unique way to challenge ourselves. We have decided to participate in an arts residency - IN OUR OWN STUDIOS! I can easily recall how motivated and focussed I was during last summer's residency in Alberta so I thought I would see if I could reproduce that - and in fact make it a habit. And, what better place to develop good habits than in your own studio! Identify places to submit art for shows etc. Finish 6 “left over” projects. So what do you think? Doable? We'll see - I am up for the challenge! I will be posting progress updates daily on my studio blog....and posting completed pieces here - stay tuned.